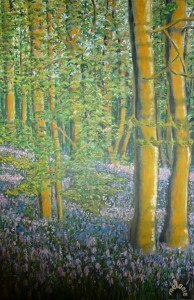 We are delighted to present “Trees”, a collection of paintings by Melanie Fox on the Staff Art Wall. Originally from County Meath, Melanie moved to Waterford in 1984. She started work at University Hospital Waterford in 1990. She spent two years working in Theatre, ten years in Coronary Care and four years in the Rheumatology Department. Melanie is now a CNS in Osteoporosis and has been managing the Fracture Liaison Service since 2006. Her favourite artist is Salvador Dali. Melanie’s paintings will be on view until 11 January 2019.